IBM’s Modern Marketing Mandate posited that “CMOs have always needed to take their industry’s pulse and devise appropriate competitive responses … today, the mission needs to extend beyond market research and marketing campaigns. CMOs have a broader responsibility to analyze and predict trends.” Betsy Rohtbart, vice president of Digital Marketing at Vonage, described this as being “prepared for the expected unexpected.” Being able to deliver on these broader responsibilities, to deliver insights from the vast continuous flow of data, and to respond quickly to customer demands, requires an agile Marketing organization. Operational excellence is the fuel behind an agile Marketing organization and its ability to help the organization achieve growth and deliver on customer value. A study by The Economist Intelligence Unit found that the processes associated with operational excellence are successful in driving growth revenues, margins and customers satisfaction. There’s no better time to revisit, reimagine, and reinvest in the processes that facilitate Marketing’s operational excellence. One systematic, proven method for doing this kind of work resides in the realm of Six Sigma and its DMAIC – define, measure, analyze, improve, and control – methodology. Six Sigma provides an approach for enabling operational excellence. You are probably familiar with the concept of Six Sigma. Introduced in the early 1980s, Six Sigma is a disciplined, statistics-based, data-driven approach and continuous improvement methodology. It differs from traditional quality improvement programs in its focus on input variables. While traditional process improvement methods depend upon measuring outputs and establishing control plans to shield customers from organizational defects, Six Sigma addresses problems at the input root cause level, thereby eliminating the need for unnecessary inspection and added costs for rework. According to General Electric, an early adopter of the program, Six Sigma is a “disciplined methodology of defining, measuring, analyzing, improving and controlling the quality in every one of the company’s products, processes and transactions – with the ultimate goal of virtually eliminating all defects.” Originally used to improve engineering and manufacturing, the Six Sigma approach has expanded to include all aspects of organizational performance. Customer value is derived from both tangibles and intangibles. Defects that reduce your value can exist in both. The Six Sigma approach identifies and eliminates defects with a structured, data-driven problem-solving method involving rigorous data gathering and statistical analysis. The statistical representation of Six Sigma describes quantitatively how a process is performing. To achieve Six Sigma, a process must not produce more than 3.4 defects per million opportunities. The philosophy behind the Six Sigma approach is that if you can reduce process variation you can improve organizational effectiveness and efficiencies. In their 2006 book, Six Sigma for Marketing Processes: An Overview for Marketing Executives, Leaders, and Managers, Clyde M. Creveling, Lynne Hambleton, and Burke McCarthy wrote that “nearly half of the top one hundred Fortune 500 companies use Six Sigma methodology in some part of their business.” They found that 70 of the top 100 companies have been in the top 100 for five or more years and that 44, or 63%, of these 70 companies implement Six Sigma to some degree. In their analysis, they found that these 44 Six Sigma users report on average 49% higher profits (compounded annually) and 2% higher Compounded Annual Growth Revenue than their peers. So, it pays to embrace Six Sigma. Six Sigma enables companies to improve Marketing’s strategic, tactical and operational processes as a way to enhance the top line to drive revenue. By applying Six Sigma to marketing you can develop a lean efficient marketing workflow, identify leading indicators of growth and become proactive about performance improvement. Six Sigma provides both a methodology for process improvement and a way to prove its value. Six Sigma has two methodologies: DMAIC and DMADV. DMAIC is used to improve existing business processes and DMADV is used to create new process or product designs that result in more predictable, mature, and defect free performance. This post focuses on the DMAIC process. Operational excellence is the fuel behind an agile Marketing organization and its ability to help the organization achieve growth. control and correct any variances before they result in defects and thereby improve performance. Let’s consider how we can apply the DMAIC process to Marketing and use this process to help drive growth. The role of marketing is to create predictable streams of revenue growth by enabling the organization to profitably identify and secure new customers, and to keep and grow the value of these customers. Therefore, Marketing must establish goals and deliverables designed to achieve these outcomes. This will require most organizations to broaden the role of Marketing beyond sales support and/or marketing communications to a more strategic role. Marketing must create a comprehensive and integrated workflow process across the various Marketing functions and the internal and external groups with which it collaborates. It must also map this process. Once you begin measuring marketing performance, you can begin to make modifications and improvements. Marketing needs to have access to data about its efforts and expenditures. This involves a collaborative relationship with Finance, Sales, and Customer Service because these organizations are often the keepers of critical data related to performance and outcomes. Marketing also needs to deploy tools and systems for capturing and monitoring data. During this step, the team needs to make key decisions related to the data including how it will be managed, how it will be shared, and what processes will be used for evaluation. There is no escaping the fact that to be successful in measurement, Marketing needs good data. Without data, you cannot measure performance and, therefore, you cannot make improvements. Measurement suggests a comparison of current and future performance to past performance. Being able to establish a benchmark using past data is an important step that eludes most marketing organizations because of the lack of quality data. It may take considerable efforts to establish the initial data points, but this step is essential to the process. 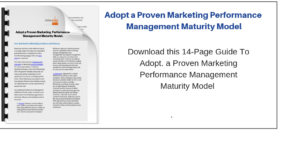 Marketing also needs to identify and standardize new metrics across the Marketing organization that tie Marketing to the business outcomes, which will provide insight into performance and facilitate strategic decisions. Tying marketing metrics to business outcomes forces Marketing to transform from a transactional function to a strategic contributor; by knowing the business outcomes, Marketing knows what objectives it needs to achieve and within what parameters and can therefore measure its performance. Identify metrics not just in terms of cost but in terms of how these investments contribute to the company’s ability to achieve its goals and generate profitable revenue. Business outcomes, for example, may be related to the specific number of customers to be acquired and at what cost, the specific rate of customer acquisition, the specific lifetime value of a customer, customer loyalty, and specifically how quickly customers adopt new products. Simply measuring performance not result in improvement. Performance improvement results from deriving insight through data analysis. By analyzing the data and understanding what it means, Marketing can determine the degree of impact it is having on the organization, and redesign processes that will improve performance. Creating a Marketing dashboard of key business initiatives can help process the data and make it easier to visualize both the impact and opportunities for improvement. Analyzing Marketing performance and processes has impact beyond the Marketing organization. The analysis may yield information that will impact Sales, Product Development, Customer Service, Finance, and IT. Marketing exists as a component within the overall company organizational system and changes to this part of the system can serve as a catalyst for changes to another part of the business system. This leads right into the next step. The main purpose of applying Six Sigma to marketing is to determine how to improve performance and processes. Data analysis should result in valuable insights that generate possibilities for improvement. These can include enhancements in tools, systems, processes, and skills. 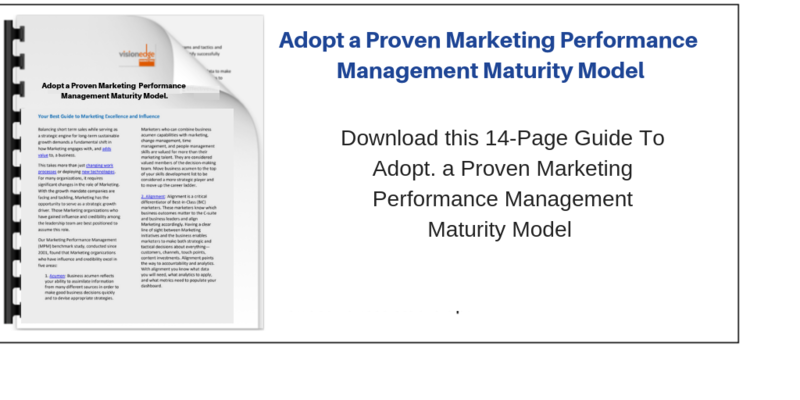 A performance-driven Marketing organization welcomes opportunities for improvement. Even though change is disruptive, developing new ways to approach the market enables the Marketing organization to play a more strategic role. Often Marketing prides itself on its creativity, even at the expense of control. But the time has come for Marketing to document its processes and best practices and to apply these consistently. A lack of standards control will result in less-than-optimal marketing execution. The role of Marketing Operations is evolving. This role provides the organization with a function and people responsible for ensuring that the knowledge gained through process improvement is documented and implemented. Regardless of whether your company establishes this role, everyone on the team needs to be formally trained on the processes and performance metrics. The entire team must understand how the processes enable Marketing to demonstrate its value and improve its performance. Operational excellence is one of three “value disciplines” that a successful organization must chose from as its underlying operational model. Applying Six Sigma to your Marketing organization delivers on customer value. It will also improve your Marketing processes enabling you to increase your ability to deliver on customer and market requirements and the customer experience. When you address operational excellence, you improve the efficiency and effectiveness of the Marketing planning process, successfully manage Marketing operations, provide transparency into Marketing processes, and improve the collaboration between Marketing and other groups within the business. In their book The Discipline of Market Leadership, Michael Treacy and Fred Wiersema suggest that operational excellence is one of three “value disciplines” that a successful organization must chose from as its underlying operational model. If you need help implementing Six Sigma or training your team on the processes and performance metrics, and how they enable Marketing to demonstrate its value and improve its performance, give us a call.